This Tax Day represents a good time to reflect on how our current tax code is designed, which is asking more from those with less. Recent analysis has demonstrated that our state’s tax code is upside-down, which means it asks more from the poorest taxpayers than it does of the richest. The 20 percent of North Carolinians with the lowest income pay 9.5 percent in total taxes as a percentage of their income, while the top 1 percent of North Carolina workers pay 6.4 percent in total taxes . This analysis reflects total taxes paid — sales, income and excise. Asking more from people with the lowest incomes who are struggling to get by makes the pathway to greater financial security steeper. North Carolina has one of the highest rates of working poverty in the nation — 1 in 8 North Carolina workers earns poverty-level wages, which for a family of four is $25,750 — and one of the lowest levels of economic mobility for people who grow up in poverty. With limited income to meet basic needs, these taxpayers pay the greatest share of the taxes through the sales tax, and the adoption of a flat income tax rate or higher standard deduction is not as effective as other tools available to address this problem. At the other end of the income distribution are top-income North Carolinians earners who have received the greatest share of the net tax cuts since 2013. 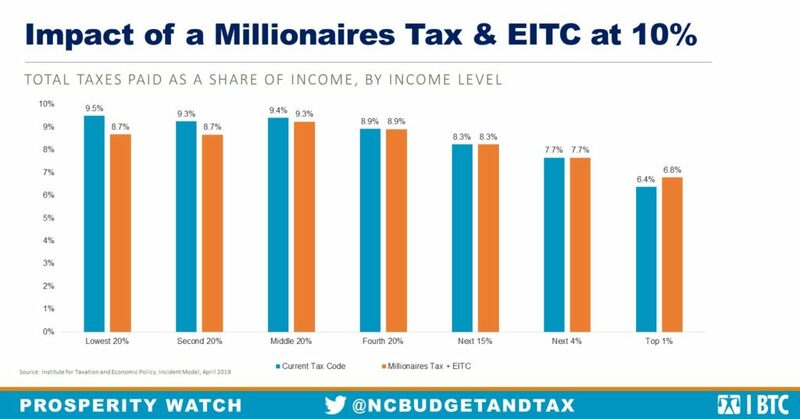 Seventy-five percent of the net benefits flowed to the top 1 percent of income earners in North Carolina from those tax cuts; the average income for those taxpayers during that time was nearly $1 million. Taking an approach to address our upside-down tax code that addresses both the struggles of working families to make ends meet on low incomes and the concentration of income at the top would include adopting both a state EITC at 10 percent of the federal level and a higher tax rate on income over $1 million. As shown below, less would be asked of low- and middle-income taxpayers, while those at the top would be asked to pay their fair share. In so doing, North Carolina would go far in addressing the upside-down tax code and reap broader economic benefits. 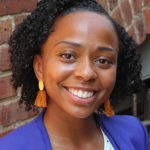 North Carolina taxpayers who have low or middle incomes — and are struggling to keep a roof over their families’ head, provide a quality early childhood experience for their kids while they work, put food on the table, and ensure health care is accessible when their family is sick — would have more money in their pockets with a state EITC. Meanwhile, those with the highest income who have seen their income significantly outpace the 99 percent would see the size of their tax cut decrease slightly to allow for greater public investments . It is these public investments — in economic opportunity through public schools, job training and small business supports — that are far more likely to generate sustained and broadly shared economic opportunity.